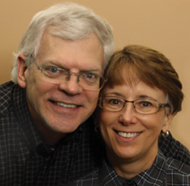 Rich and Pam Poll have served together in ministry since 1981 when Rich quit his engineering job after being accepted as a student at the International School of Theology affiliated with Campus Crusade for Christ. This seminary required them to raise support for the three years they were there so that they could focus on their education and minister in a local church. Those three years were invaluable and faith building as they watched God provide for every financial need including the funding for their overseas mission project and their summer internship. After graduating with an M.Div., Rich went to work for 10 years on the research team of Christian Research Institute in California. Pam worked as art director for the ministry magazine, Christian Research Journal. In 1995 Rich founded Apologia and soon after launched Apologia Report. Established in 1995, Apologia's mission is primarily educational, to equip Christians to engage their culture with the claims of Jesus Christ — to present the Christian worldview as a viable option in the 21st century. We do this by providing timely, accurate religious research information within the field of Christian "apologetics," the area of theology that deals specifically with the defense of the Christian faith. This is accomplished through Apologia Report, our email weekly newsletter, and AR-talk, an online forum that provides Christians and non-Christians alike the opportunity to find resources to answer their spiritual questions. Apologia's goal is to give Christians—especially those who are leaders in the church, education, and missions—access to information that will keep them up to date on spiritual trends so that they can more effectively influence their world for Christ. By God's grace Apologia is having an international impact. I find Apologia Report very helpful. Here in Ukraine it is the only way we can keep updated concerning the latest religious issues and trends in USA. This is vitally important because eventually we have the same issues here in the countries of the former USSR. I print out each issue and pin it on the seminary announcements board for our students to read. I appreciate how Apologia Report succinctly summarizes the latest news pertinent to apologetics and gives very helpful references and links. Apologia is a 501(c)3 non-profit organization and relies on the donations of those who support the work of this ministry to keep it going. Please see the Reader Response page to get an idea of the impact Apologia is having. If you would like to support this work, please click on the donate link.